Alfred Gessow, who was born in Jersey City, was a 1943 civil engineering graduate of the City College of New York and received a master's degree in aeronautical engineering from New York University. In 1944, he joined the government's National Advisory Committee on Aeronautics (NACA), a predecessor organization of the National Aeronautics and Space Administration. He conducted helicopter research at the Langle Research Center before transferring in 1959 to NASA headquarters. He served as fluid physics branch chief, assistant research division chief, and director of the aerodynamics office. In 1981 he joined the University of Maryland faculty where he founded the university's Center for Rotorcraft Education and Research and served as its director until 1992, when he assumed the emeritus status. The center which has been renamed in his honor, is one of the nation's leading institutions of rotorcraft research and education. Professor Gessow devoted much of his government and teaching careers to expanding the knowledge of helicopter aerodynamics, developing new theoretical approaches and conducting flight experiments. His book "Aerodynamics of the Helicopter" coauthored with Garry C. Meyers, Jr., remains one of the leading texts on the subject so many years after its publication. An administrator who was a professor emeritus and former chairman of the Maryland's aerospace engineering department, died on May 2, 2002. Professor Gessow was one of the 1943 founders of the American Helicopter Society and was active throughout his life in shaping the organisation as the world's leading professional technical society for the advancement of vertical flight technology. He served as technical director of the society and was the founding editor of the 'Journal of the American Helicopter Society' and founding chairman of its education committee. He served on the National Academy of Sciences National Reserach Council, the Army Science and Technology Boards, and the Army Science Board, and was active in professional ortanizations such as the AIAA and SAE. He was a helicopter consultant to the Army, NATO and the Institute for Defense Analyses. The Alfred Gessow Award is given each year for the best technical paper at the Society's Annual Forum. The award consists of a plaque and transportation for one author to the European Rotorcraft Forum (ERF). The award honors Dr. Alfred Gessow (1922 - 2002), a pioneer in the helicopter field and co-author of the famous classic, “Aerodynamics of the Helicopter”. 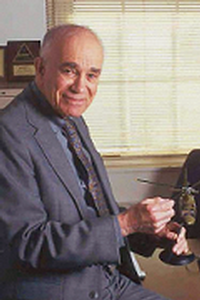 Gessow was the founding editor of the Journal of the American Helicopter Society and was recognized with the NASA Exceptional Service Medal (1977), AHS Honorary Fellow (1978), Nikolsky Honorary Lectureship (1985–Lecture "Understanding and Predicting Helicopter Behavior–Then and Now") and Alexander Klemin Award (1996), and was a Fellow of AIAA (1986).